Planting Dates: Late winter for spring and early summer plants. Plant seed or transplants in late summer for fall plants. Planting Method: Seed or transplants. Soak seed in seaweed water overnight before planting. Seed Emergence: Up to 3 weeks. Normal time is 11-28 days at 50-85°. Growth Habits: Leafy vegetable or herb. Foliage ranges from flat-leafed to curly. 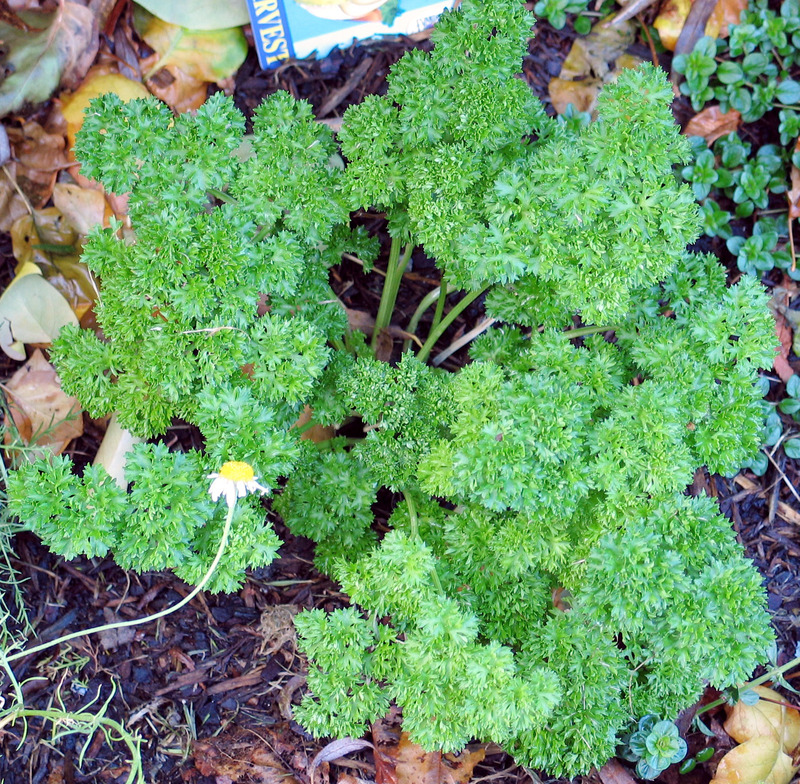 Curly parsley grows to 10 inches, Italian flat leaf grows to 18 inches. Culture: Easy to grow if planted at the right time. Parsley likes cool weather. It also likes healthy, moist, well-drained soil. Keep seed heads cut off to maintain compact plants. Occasional light feedings with organic fertilizer is better than heavy shots. Keep the soil mulched with compost. When parsley blooms, it dies. Pinch off shoots as they emerge. Troubles & Solutions: The lime green, black, and cream-colored swallowtail butterfly larvae (Parsleyworm) should be hand removed if they get piggy and start eating too much. These beautiful butterflies are as important as the parsley. Plant enough so they can have their share. Harvest and Storage: Any time there’s foliage to use. Best to use fresh, but can be stored in the refrigerator. Notes: Parsley is said to aid the growth of tomatoes and roses. It can be eaten fresh to serve as a breath freshener. Varieties: Gigante D’Italia, Single-Leaf Italian, Frisca Curly Parsley, Moss curled, Evergreen, plain Italian.